Lukasz Fabianski will no doubt be a Premier League goalkeeper again next season, but at what cost? It’s a question which, in its most literal sense, has been answered with a figure which has left Swans’ fans incensed. Reports from the Guardian suggest that a fee as little as £5m would be enough to prise away the club’s star asset which, even before the days of £90m players stinking up the top flight, would have been an absolute steal. From the outside, £5m might seem reasonable. Besides, Fabianski (or Flappy-hand-ski) isn’t that good, right? I mean, he saved a couple of penalties for Arsenal but other than that, he was awful. That is what many beyond Swansea will tell you. What they won’t tell you is that he is one of four Premier League goalkeepers (alongside David De Gea, Nick Pope and Hugo Lloris) who has saved at least 71% of the shots he’s faced this season, or that only Stoke City’s Jack Butland has made more saves than him per 90 minutes. Filter in the fact that he’s saved more penalties (3) than any other goalkeeper in the league this season, claimed more crosses (47) than anybody other than Nick Pope and has played every single minute of what turned out to be Swansea’s final Premier League campaign and you’ll start to realise just why Swansea fans expected a tad more than £5m for a player they hold in such high regard. The respect is mutual, too. 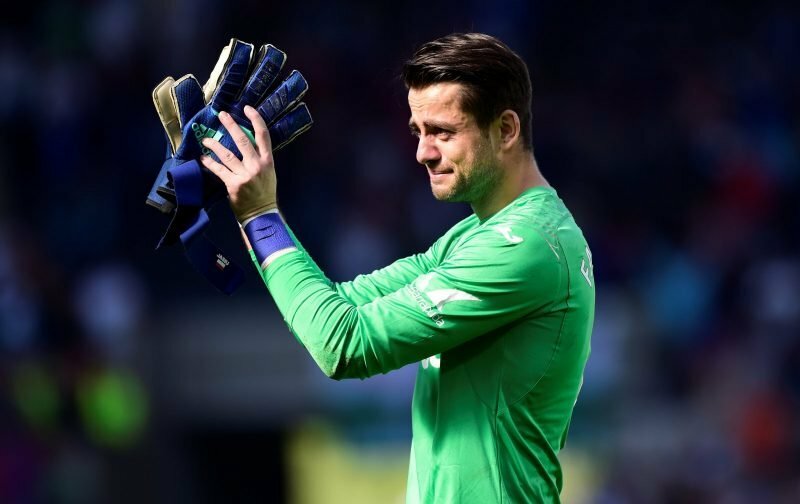 Chants of “Fabianski, we want you to stay” were met with applause from the Polish ‘keeper during Sunday’s game, while his unfeigned tears when leaving the pitch showed just how much he, unlike some others, truly care. Distraught at relegation, but just as upset to be saying what looked like goodbye to a place he’s called home for 4 years, the final pictures of him in a Swansea shirt will not be looked back on with the pleasure which they should. But I understand why the club might seem so eager to get rid. Morally it would be wrong of them to stand in the way of a move back to the top flight. After years of nothing but absolute professionalism, it’s the very least he deserves. And besides, the last thing you need in a squad which has just been relegated is an extra reason for internal outrage. After last summer’s Sigurdsson saga, dragging out another high-profile departure for the sake of an extra couple of million could have a devastating effect on the already diminishing reputation of the Swansea board. There is an argument that turning down any offers for Fabianski and forcing him to play out his contract at the Liberty Stadium could give us a major boost in next season’s promotion push, but that point is weakened by the potential impact it could have in the dressing room. A key figure behind the scenes with many a friend in the squad, a refusal to let Fabianski leave could irk a number of players. I doubt any of them would begrudge him a move back to the big time. However, it’s Fabianski’s replacement which complicates matters further. Nordfeldt has looked far from convincing in the games which he’s played. In fact, the only thing I’d say is less convincing is our ability to sign a good player at a decent price. Though you wouldn’t think it looking at our squad, there has been a fair bit of money spent in recent years on playing staff – most of which have been dire. Almost £70m was spent last season on Wilfried Bony, Sam Clucas, Roque Mesa and Andre Ayew. The argument that Sam Clucas is the only one of them to have done anything stands firm, but that’s a scathing indictment on our recruitment given the torrid season he’s had. Given our incapability to sign players who haven’t already donned the Swansea shirt, I wouldn’t be a bit surprised to see Dorus De Vries back between the sticks come August! While his destination and price tag are still relatively unclear, one thing for certain is that Fabianski will not want to stick around at a Championship club – and he won’t be the only one. It’s set to be a summer of thank yous and goodbyes on SA1, but if the situation can be taken advantage of, we could be in for a thrilling season once again. Good read, still waiting for Vorm to be linked. That’s bound to crop up at some point aswel.